Research now suggests high blood pressure can be reduced by aquatic therapy. Recent NASMI studies show that warm water immersion like that offered by hot tub therapy may significantly decrease both systolic and diastolic blood pressure. In these studies a reduction in blood pressure also occurred during immersion in cold and neutral temperatures to a degree, suggesting that increased external pressure from the weight of the water may be a factor in this decrease. However, diastolic blood pressure was reduced significantly more in warm water than in cool or neutral water experiments. Even though blood pressure seemed to be lowered with immersion in all water temperatures, the positive effects of lowered blood pressure remained with the individual much longer after leaving warm water than after exiting water with cold and neutral temperatures. This was especially evident in the study participant’s diastolic blood pressure and suggests that regular warm water therapy may be more beneficial for those looking to decrease their blood pressure in a lasting way. This is part 5 of a 7 part series. 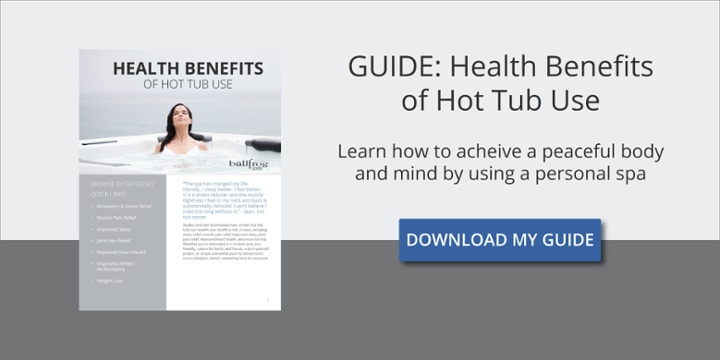 Part 6 will explain additional health benefits of hot tub therapy like improved brain function.